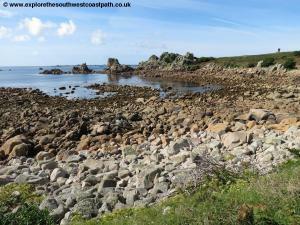 St Agnes is the most south-westerly of the inhabited islands and has a varied coastline, with several sandy bays, rocky outcrops and an area of heathland to the south of the island. 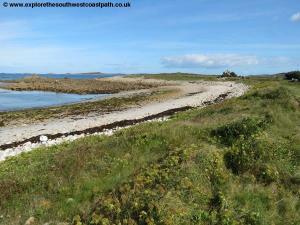 This walk goes around the coast of the island offering lovely views over the neighbouring islands of Annet and Gugh (the latter reached via a sandbar at low tide). 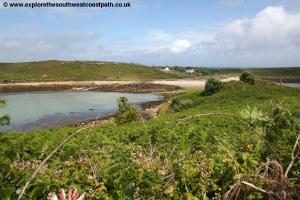 There are several sandy beaches on the way to make for a relaxing walk and there is also a pub and shop on the island. 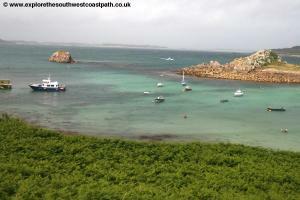 St Agnes normally has daily boats from St Mary's, leaving the quay normally around 10 to 10:15am with return boats at various times, due to weather and tide conditions but usually sometime between 3 and 4pm, with a wider choice of times in the summer. 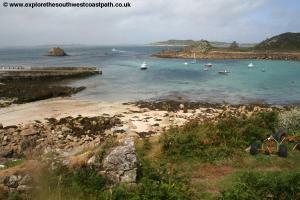 Unlike the other islands an evening boat trip is also often offered to St Agnes and if you want to travel over in the the morning you can normally return back on the return boat of the evening trip (if it is running), but check when buying your ticket. 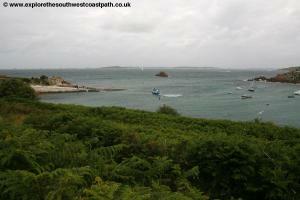 If you are staying on an island other than St Agnes or St May's consult the boat trip notice boards for trips to St Agnes. 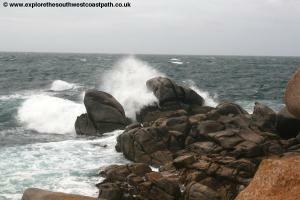 Note that the crossing to St. Agnes can be rough if the weather is windy. Being a fairly small island, the choice of accommodation the island is quite limited (there aren't any hotels on the island for example), but there are guest houses, bed and breakfasts and a campsite. 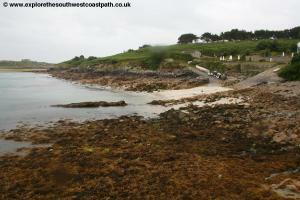 Covean Cottage is a guest house with three bedrooms offering bed and breakfast accommodation. The Parsonage offers both bed and breakfast and self catering accommodation. 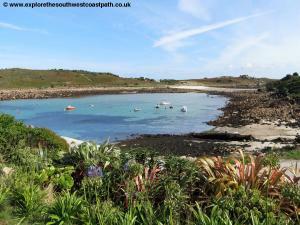 Troy Town campsite is the only campsite on the island and is located to the west of St Agnes, right on the coast. 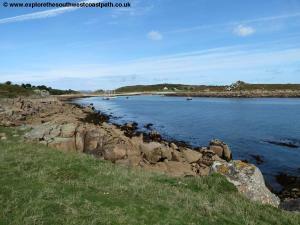 They also offer self catering accommodation. 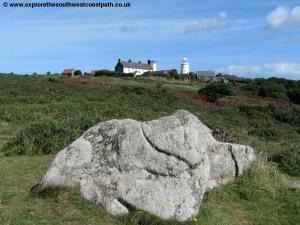 For further details of accommodation on St Agnes visit St Agnes Where to Stay. 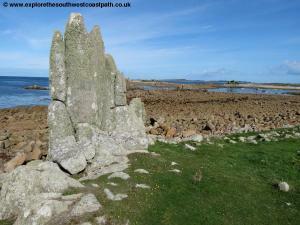 St Anges is a lovely island and a walk around it's stunning coast is a real treat. The boats will normally drop you at the quay on the north east corner of the island and normally return from the same spot. 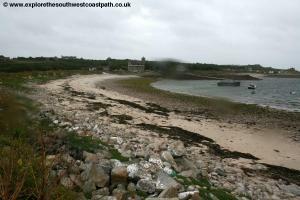 From the ferry slipway walk along the quay wall and continue on the main track, soon passing the Turks Head pub on the right. This is the most south-westerly pub in England and has a lovely atmosphere. 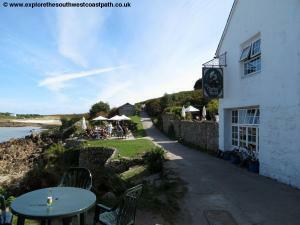 During the summer months there is a boat trip most evenings from St Mary's to St Agnes to enjoy a meal and entertainment at this pub, which has a large outdoor seating area. 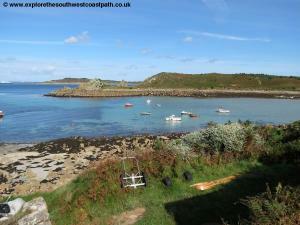 Continue past the pub on the main track which being a little raised up offers lovely views over to neighbouring Gugh which you can also walk out to over the sand bar if the tide is low. 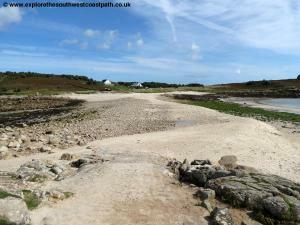 Ahead the track splits, with a fork to the left going down to the sand bar and the main track turning to the right. Go left here, as the path soon descends down to the sand bar. 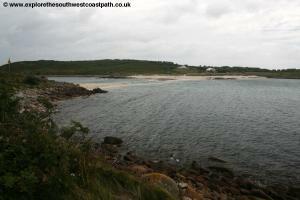 As well as being the access onto Gugh this is a wonderful beach, with soft sand. 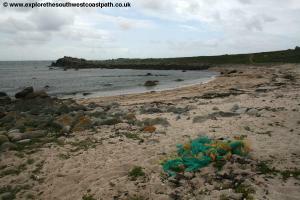 The northern shoreline (Porth Conger) is a little more rocky, whilst the south facing side of the beach (The Cove) is very sheltered and better for bathing, with fewer rocks and shallow water. Just before this path descends down onto the beach turn right on the narrow footpath running along the back of the beach. 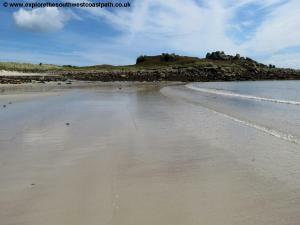 This goes beside some fields on the low cliffs and very soon comes round to another beach, This beach is also sandy, although rocky at lower tide so is not so good for bathing. 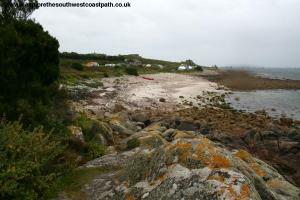 Take the path over the beach or along the back of the beach and at the other end of the beach take the obvious path at the back of the beach, just before the low cliffs start. 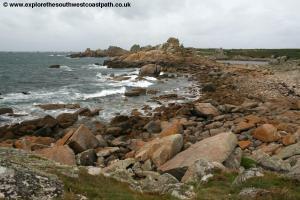 The path gradually climbs and soon the terrain becomes more rocky, with numerous granite outcrops. 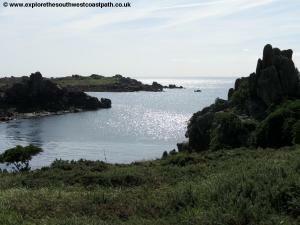 A wide path leads away from the coast path to the right to the Cairns and rocks at the top of the hill, but keep ahead on the coast path with the see on your left. 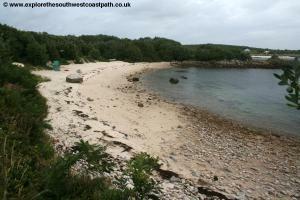 Soon this brings you down to another good sandy beach, Wingletang Bay. 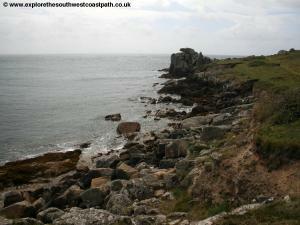 The island is very narrow with the west coast being only around 100 metres to the right. 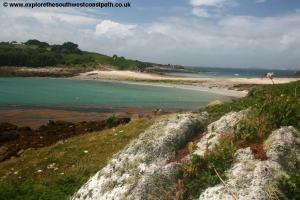 From the south side of the beach take the most coastal path around the southern tip of the island, Horse Point. 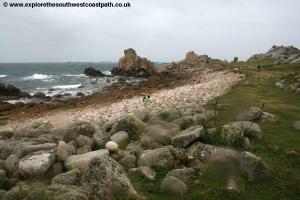 Here the sea gets rougher as you turn onto the west side of the island, exposed to the force of the Atlantic rather than the more sheltered east coast. 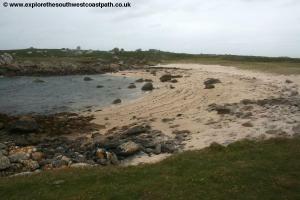 Round the rocky head and you come to another beach, Porth Askin. Take the low path along the back of this beach and very soon after you come to another beach, more pebbles than sand this time, Porth Warna. 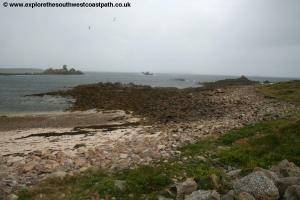 From here take the main path from the north edge of the beach and follow this round a rocky outcrop to the left and alongside a rocky bay. 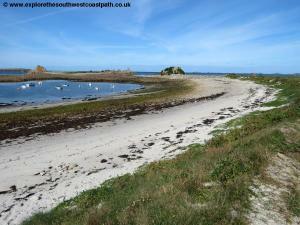 Fork left with the path, keeping the sea to your left as the more wild Wingletang Down we have been walking beside gives way to the cultivated fields on the right as we had back towards the village. 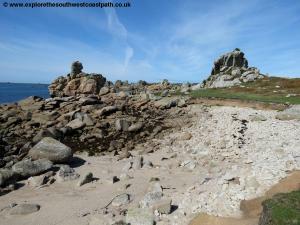 Round the rocky bay of St Warna's Cove and keep on the low path just above the beach, passing more rocky outcrops. 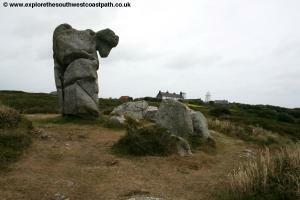 Just inland is an unusually shaped rock, the Nag's Head which is worth a quick diversion to see. 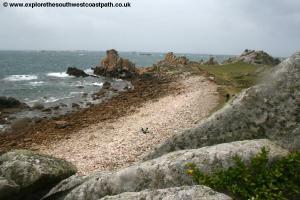 Continue on the coast path passing another couple of rocky outcrops to come to another pebbly beach, where someone seems to have piled all the pebbles onto one another, crating little piles of stones along the beach! 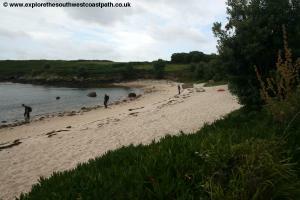 Continue on the low coast path to Long Point and an area of open ground behind this beach. Keep to the coast here as you turn right with the coast (still on your left) and pass the maze. 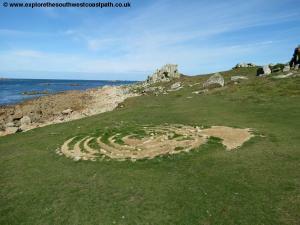 This isn't a maze in the traditional sense, but rather a sort of grass and stone circle. 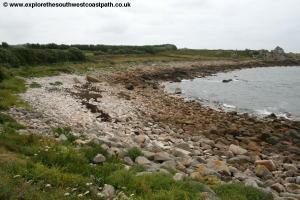 Continue on the obvious low path along the grassy banks beside the coast passing numerous rocks to Carnew Point, the most westerly point of the island with fine views over to neighbouring Annet, one of the larger uninhabited islands. Rounding the headland you come to the Troy Town campsite a lovely site right on the coast (but rather exposed to westerly winds). 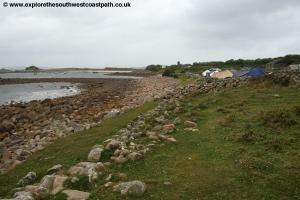 Here you take the path behind the first couple of camping fields (where the dry stone walls provide a bit of shelter) and then come into the main camping field. Go through the gate here past the toilets on the right and into the last field of the campsite. 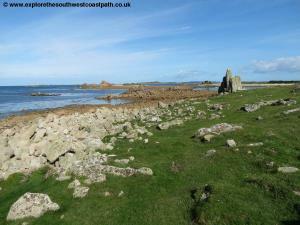 The path then joins a wide track which you follow past the lovely church on the left hand side, which is worth a visit. 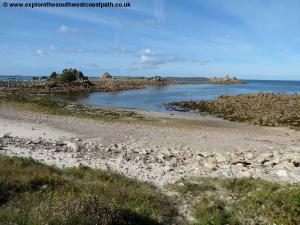 Continue along the track past the church and to a T-junction where you turn left down to another excellent beach, Periglis. 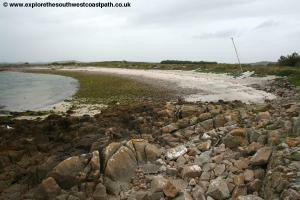 This is a good sandy beach, with rocks at lower tide, that also forms a little harbour, and boats are often moored here and there is also another slipway. 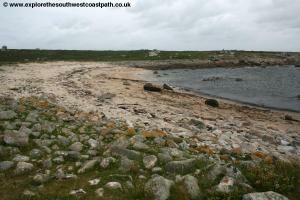 Take the low path along the back of this beach and at the north end of the beach there is a little rocky island. Beyond this rocks lead out to another island Burnt Island (well an island at high tide anyway), which has what looks like the remains of a church but is I believe a navigational aid for ships. 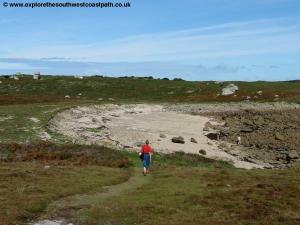 Rounding the corner of the coast here you continue on the path behind another sandy beach, Porth Coose, which has a natural pool of water behind it too. 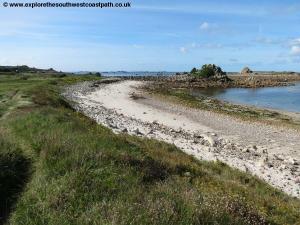 At the north end of this beach the main coast path turns to the right, missing out the very north west corner of the island and cutting round to Porth Killier. 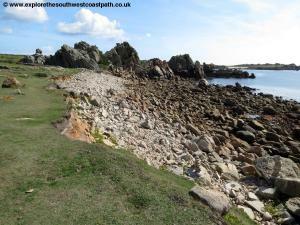 If you prefer though a low (and in places rather rough and ready) path does round this corner of the island, where the sea can be quite rough. 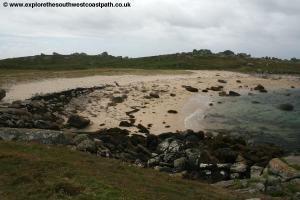 Whichever path you take, you soon end up at Porth Killier, another beach that is a mixture of sand and pebbles, with rocks at the shore line. 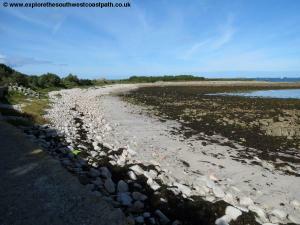 Take the wide track behind this beach, that has a little sea wall along part of it. To the right are the small fields where flowers are grown during the spring. 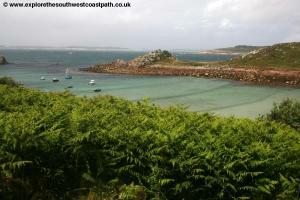 Follow this main track that soon brings you back out to the quay, the end of the walk. 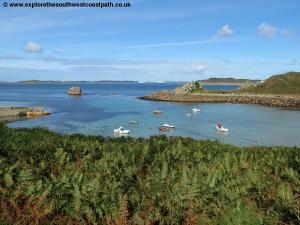 If you have time it is also well worth exploring the inland charms of the island. 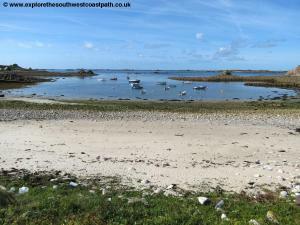 The community on the island is split into four communities, all spread out along the main track leading up from the quay (just keep to the main track when you pass the path down to the sand bar for Gugh). The first of these is Higher Town, the second Middle Town where you'll find the shop and post office as well as the islands school. As you enter Middle Town the track splits, with the part to the right going to the stores and post office, school and lighthouse whilst the left fork continues on to Lower Town and Troy Town on the west of the island. 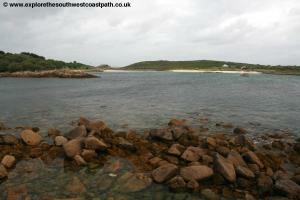 The walk is circular and ends at the quay, which is the normal departure point to the other islands. Here are some photos of the walk. Sadly the weather was wet for part of it, which has caused some rain on the lens on some of the pictures. 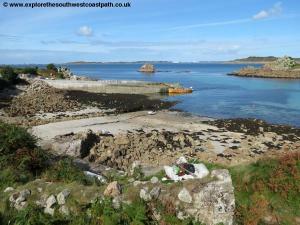 Ordnance Survey Landranger map 101 covers the Isles of Scilly and is available in the newsagents shop in Hugh Town on St Mary's or at bookshops nationwide as well as Amazon.